This kind of children&apos;s camera is the coolest kids camera in the world, which has a screen of 1.77in. It is suitable to enhance children&apos;s interest of taking photos, develop their brain and make them love outdoor activities. 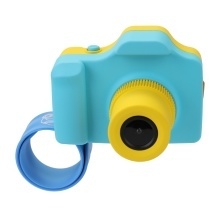 Mini digital camera has beautiful appearance, lovely design and can attract children&apos;s attention. Small and light, easy to carry. This is the most suitable gift for children. The small SLR camera highest support for the 32GB TF card (not included). USB cable allows you to quickly transmit photos to the computer. The built-in straps are easy for the children to take.